Content: Box with 6 miniatures: 3 Order Sergeants (Combi Rifle), 1 Teutonic Knight (Combi Rifle, Panzerfaust), 1 Magister Knight (Panzerfaust), 1 Specialist Sergeant (Multi Sniper Rifle) With markers to cut. #CVB 280244 - Price: $ 44.56 - $ 35.64 On Sale! Content: 2nd EDITION REVISED Hard cover book, 232 pages, in full color. 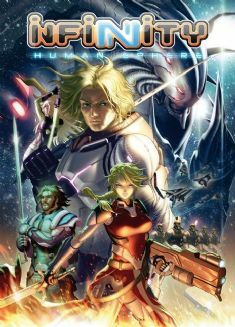 With pictures, illustrations, and everything you need to play Infinity: background, rules, complete army lists, markers and templates. #CVB 289903 - Price: $ 46.90 - $ 37.52 On Sale! Content: "Infinity Human Sphere" is an expansion. 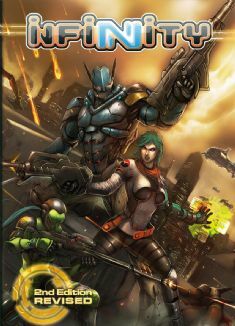 It is necessary to have "Infinity" rulebook, or to download the free core rules from http://www.infinitythegame.com to play Infinity. Hard cover book, 204 pages, in full color. With pictures, illustrations, and everything you need to enhance your experience to play Infinity: background, new rules, enhanced army lists, markers and templates. #CVB 289803 - Price: $ 46.90 - $ 37.52 On Sale! #CVB 280633 - Price: $ 44.56 - $ 35.65 On Sale!